Natural Stone counter tops have never been so popular! Whether it's a newly constructed home or a home that's been remodelled, natural stone appears to be the products of choice. 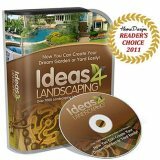 They're beautiful, durable and easily maintained. Browse through more FAQ's below! I am looking for a granite sealer that is food grade. Is your sealer safe to roll out dough on? I just purchased the daily spray cleaner. How often may I use the granite cleaner? I don't want to over do it, but love a clean, shiny counter. Is a granite kitchen counter top more porous than marble? Why do most recommend the use of granite instead of marble for kitchen counters? Is it safe to use a sealer on my stone countertops? Should all stone counter tops be sealed? How do I know if the stone I am considering needs to be sealed? How often do I need to apply a sealer? What is the best way to get rid of dull spots on my marble vanity and bring back the normal shine? An acidic cleanser was spilled on my marble vanities. How do I repair them? How do I clean my Sapphire Blue granite countertop? My granite shows some darkening when water is left on it for more than a few minutes but I believe that this is normal. Should I apply more sealer? My stone counters are no longer shiny. How do I get the shine back? How do I remove a soapy film build up from my counters? What treatment should be given to our tumbled natural stone back splash so that the grout and tiles won't stain with oil or vapors from cooking? Q. I am looking for a granite sealer that is food grade. Is your sealer safe to roll out dough on? A. Yes, the impregnating sealer we carry is safe for use on food preparation surfaces. Q. I just purchased the daily spray cleaner. How often may I use the granite cleaner? I don't want to over do it, but love a clean, shiny counter. A. You can use the spray cleaner everyday... 3,4, or even 5 times a day. This light duty cleaner is safe to use on natural stone counter tops. Q. Is a granite kitchen counter top more porous than marble? A. Generally speaking, yes. The pores in granite are generally larger than the pores in marble. Q. Why do most recommend the use of granite instead of marble for kitchen counters? A. Even though granite is usually more absorbent than marble, it isn't prone to etching. Staining issues can be controlled with a sealer whereas etching is avoided by being careful... very, very careful! Also, granite is harder than marble. Q. Is it safe to use a sealer on my natural stone counter tops? A. Yes. Allow the sealer to absorb for approximately 24 hours before using your counter top. 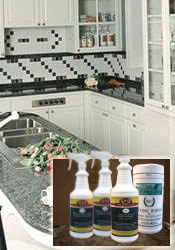 An impregnating type sealer which is water and oil repellent is best for kitchen counter tops. Try this impregnator sealer. You only have to seal every 10 years! Q. Should all natural stone counters be sealed? A. No. A sealer is used on stones considered "absorbent or porous" to avoid staining. If your natural stone counter tops are porous, you should seal. If your stone is dense, it will absorb very little of anything including a sealer. Q. How do I know if the stone I am considering needs to be sealed? Q. How often do I need to apply a sealer? A. 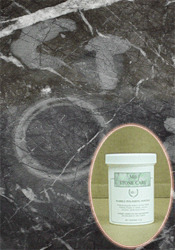 This depends on the natural stone sealer you choose. Some manufacturers recommend every 6 months to a year. Others, every 3-5 years or even every 10 years. Q. I have marble counter tops in the kitchen. Some vinegar got on the counters and now we have a light spot. I believe that it is the sealer that got discolored. What is the best way to get rid of these dull spots and bring the normal shine back? A. When acid (vinegar) comes into contact with marble (calcium carbonate), they chemically react. It's called etching. Natural stone sealers penetrate the stone and do not prevent this natural reaction. If you do in fact have a polyurethane coat on top of your stone (not the correct type of sealer for a natural stone counter top), then you have a different problem all together. Call a stone professional to strip off the coating. If the stone is etched, it can be refinished by a professional stone restorer. 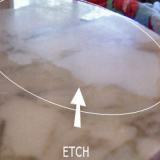 Light to medium etching can be repaired with marble polishing powder. Q. Recently a cleaning firm spilled a cleaner that is obviously acid on my marble vanities. 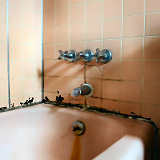 They were sealed, but the damage is still very evident in the form of hundreds of small circles. What would you recommend as the way to repair them, the materials to use, etc? Would it be better to replace the vanities? A. Sealing DOES NOT prevent etching. Sealing your stone helps prevent staining. You don't need to replace your vanity tops. They can easily be repaired, by a natural stone restoration professional or the marble polishing powder. Q. How do I clean my granite kitchen counter tops? I have never treated them. I never thought I had to. I would like to know what I need to do to restore the shine and protect them. Besides telling me the steps, are you able to recommend the best products? A. Clean your stone with a friendly, easy to use cleaner and then polish it once a week or so to maintain and make your day to day cleaning easier. Take a look at Countertop Care Kit Three. Q. We had granite installed in our kitchen. It looks great and has not shown any sign of staining. Our installer wiped on a sealer and informed us that we should apply a sealer about every 6 to 12 months. Our granite does show some darkening when water is left on it for more than a few minutes but I believe that this is normal. Should I apply more sealer? A. If water darkens your stone then it means that it was not sealed properly. Keep sealing. Q. My natural stone counter tops are no longer shiny. How do I get the shine back? A. Most of the time when a customer asks me why their countertop is not so shiny anymore, it turns out that some sort of film sitting on the surface. This happens when one doesn't use the proper cleanser, or when they clean their granite surface with water and dish soap. (This will eventually lead to a soap film build up.) Remove the soap film. Q. How do I remove a soapy film build up from my natural stone counter tops? A. This soap film remover will remove soap film build up, hard water and mineral deposits. 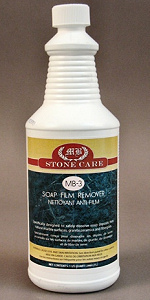 It also works great for deep cleaning your natural stone counter tops too. Q. What is the best way to clean granite countertops? A. 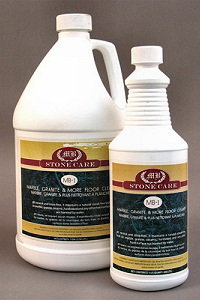 Use a cleaner made for natural stone. They are easy to use and you won't have to worry about short term OR long term damage to your stone. Q. We are having tumbled stone installed for our kitchen backsplash. What treatment should be given after the installation so that the grout and tiles won't stain with oil or vapors from cooking? A. To help prevent staining you should apply a good quality stone sealer. It will seal your grout too!